Backpropagation is the key algorithm that makes training deep models computationally tractable. For modern neural networks, it can make training with gradient descent as much as ten million times faster, relative to a naive implementation. That’s the difference between a model taking a week to train and taking 200,000 years. Fundamentally, it’s a technique for calculating derivatives quickly. And it’s an essential trick to have in your bag, not only in deep learning, but in a wide variety of numerical computing situations. To create a computational graph, we make each of these operations, along with the input variables, into nodes. When one node’s value is the input to another node, an arrow goes from one to another. These sorts of graphs come up all the time in computer science, especially in talking about functional programs. 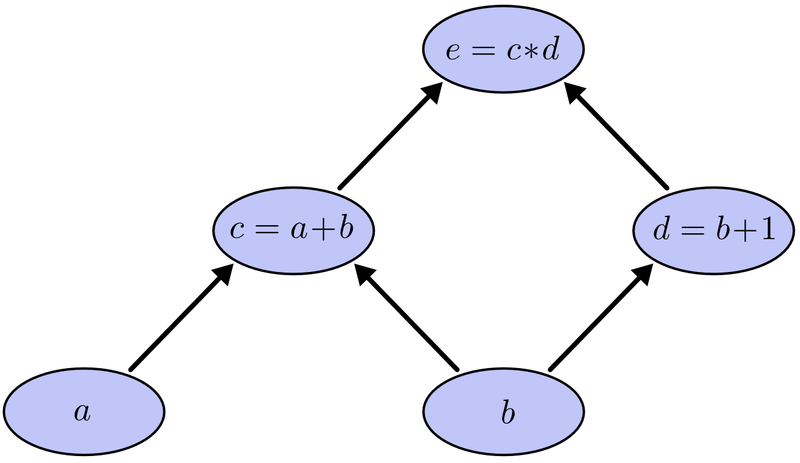 They are very closely related to the notions of dependency graphs and call graphs. They’re also the core abstraction behind the popular deep learning framework Theano. The expression evaluates to 66. If one wants to understand derivatives in a computational graph, the key is to understand derivatives on the edges. If aa directly affects cc, then we want to know how it affects cc. If aachanges a little bit, how does cc change? We call this the partial derivative of cc with respect to aa. Below, the graph has the derivative on each edge labeled. What if we want to understand how nodes that aren’t directly connected affect each other? Let’s consider how ee is affected by aa. If we change aa at a speed of 1, cc also changes at a speed of 11. In turn, cc changing at a speed of 11 causes ee to change at a speed of 22. So ee changes at a rate of 1∗21∗2with respect to aa. This accounts for how b affects e through c and also how it affects it through d.
This general “sum over paths” rule is just a different way of thinking about the multivariate chain rule. The problem with just “summing over the paths” is that it’s very easy to get a combinatorial explosion in the number of possible paths. The above only has nine paths, but it would be easy to have the number of paths to grow exponentially as the graph becomes more complicated. This is where “forward-mode differentiation” and “reverse-mode differentiation” come in. They’re algorithms for efficiently computing the sum by factoring the paths. 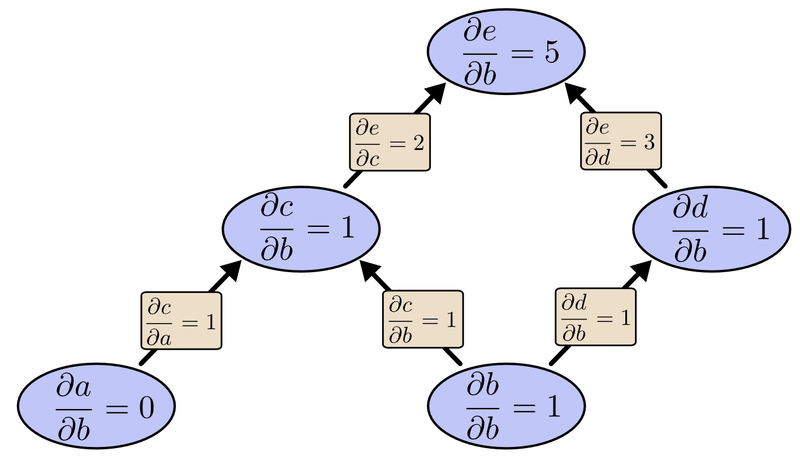 Instead of summing over all of the paths explicitly, they compute the same sum more efficiently by merging paths back together at every node. In fact, both algorithms touch each edge exactly once! 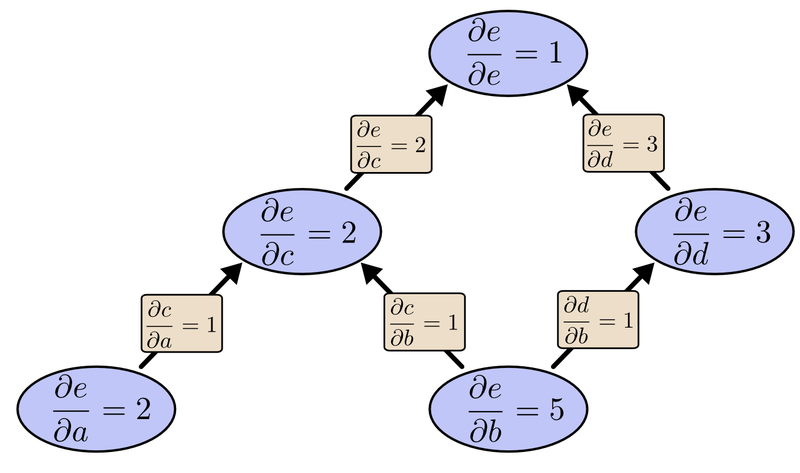 Forward-mode differentiation starts at an input to the graph and moves towards the end. At every node, it sums all the paths feeding in. 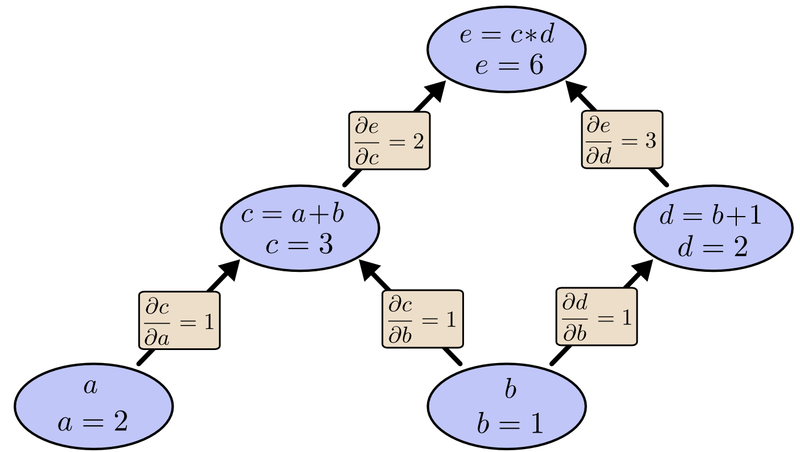 Each of those paths represents one way in which the input affects that node. By adding them up, we get the total way in which the node is affected by the input, it’s derivative. Though you probably didn’t think of it in terms of graphs, forward-mode differentiation is very similar to what you implicitly learned to do if you took an introduction to calculus class. Reverse-mode differentiation, on the other hand, starts at an output of the graph and moves towards the beginning. 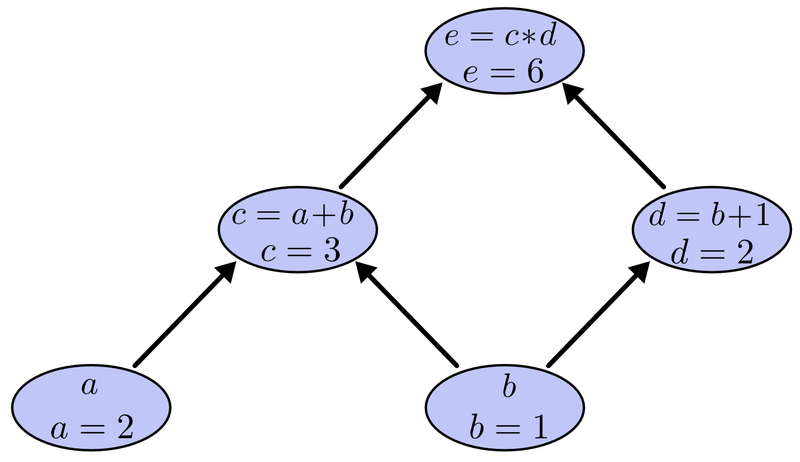 At each node, it merges all paths which originated at that node. At this point, you might wonder why anyone would care about reverse-mode differentiation. It looks like a strange way of doing the same thing as the forward-mode. Is there some advantage? We can use forward-mode differentiation from bb up. This gives us the derivative of every node with respect to bb. We’ve computed ∂e∂b∂e∂b, the derivative of our output with respect to one of our inputs. When I say that reverse-mode differentiation gives us the derivative of e with respect to every node, I really do mean every node. We get both ∂e∂a∂e∂a and ∂e∂b∂e∂b, the derivatives of ee with respect to both inputs. Forward-mode differentiation gave us the derivative of our output with respect to a single input, but reverse-mode differentiation gives us all of them. For this graph, that’s only a factor of two speed up, but imagine a function with a million inputs and one output. Forward-mode differentiation would require us to go through the graph a million times to get the derivatives. Reverse-mode differentiation can get them all in one fell swoop! A speed up of a factor of a million is pretty nice! When training neural networks, we think of the cost (a value describing how bad a neural network performs) as a function of the parameters (numbers describing how the network behaves). We want to calculate the derivatives of the cost with respect to all the parameters, for use in gradient descent. Now, there’s often millions, or even tens of millions of parameters in a neural network. So, reverse-mode differentiation, called backpropagation in the context of neural networks, gives us a massive speed up! When I first understood what backpropagation was, my reaction was: “Oh, that’s just the chain rule! How did it take us so long to figure out?” I’m not the only one who’s had that reaction. It’s true that if you ask “is there a smart way to calculate derivatives in feedforward neural networks?” the answer isn’t that difficult. But I think it was much more difficult than it might seem. You see, at the time backpropagation was invented, people weren’t very focused on the feedforward neural networks that we study. It also wasn’t obvious that derivatives were the right way to train them. Those are only obvious once you realize you can quickly calculate derivatives. There was a circular dependency. Worse, it would be very easy to write off any piece of the circular dependency as impossible on casual thought. Training neural networks with derivatives? Surely you’d just get stuck in local minima. And obviously it would be expensive to compute all those derivatives. It’s only because we know this approach works that we don’t immediately start listing reasons it’s likely not to. That’s the benefit of hindsight. Once you’ve framed the question, the hardest work is already done. Derivatives are cheaper than you think. That’s the main lesson to take away from this post. In fact, they’re unintuitively cheap, and us silly humans have had to repeatedly rediscover this fact. That’s an important thing to understand in deep learning. It’s also a really useful thing to know in other fields, and only more so if it isn’t common knowledge. Are there other lessons? I think there are. Backpropagation is also a useful lens for understanding how derivatives flow through a model. This can be extremely helpful in reasoning about why some models are difficult to optimize. The classic example of this is the problem of vanishing gradients in recurrent neural networks. Finally, I claim there is a broad algorithmic lesson to take away from these techniques. Backpropagation and forward-mode differentiation use a powerful pair of tricks (linearization and dynamic programming) to compute derivatives more efficiently than one might think possible. If you really understand these techniques, you can use them to efficiently calculate several other interesting expressions involving derivatives. We’ll explore this in a later blog post. This post gives a very abstract treatment of backpropagation. I strongly recommend reading Michael Nielsen’s chapter on it for an excellent discussion, more concretely focused on neural networks. Thank you to Greg Corrado, Jon Shlens, Samy Bengio and Anelia Angelova for taking the time to proofread this post. Thanks also to Dario Amodei, Michael Nielsen and Yoshua Bengio for discussion of approaches to explaining backpropagation. Also thanks to all those who tolerated me practicing explaining backpropagation in talks and seminar series! ← EEG reference ? you should know or may know ?